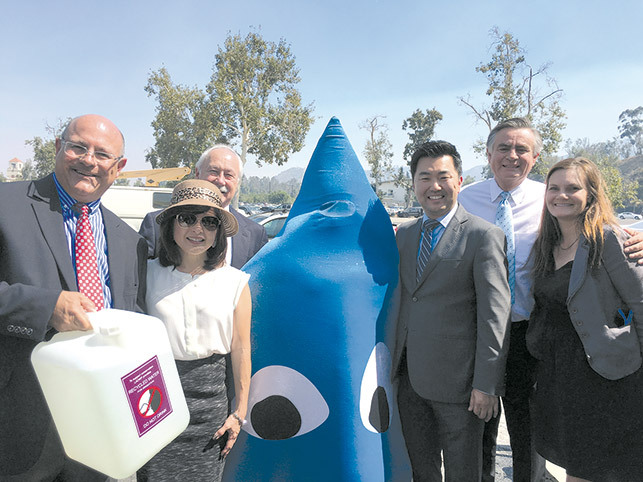 Los Angeles City Councilman David Ryu, 4th District, recently joined officials from the Los Angeles Department of Water and Power (LADWP), the Los Angeles Bureau of Sanitation and the Los Angeles Zoo to announce the opening of Los Angeles’ Recycled Water Fill Station at the zoo. Councilman David Ryu (third from right), 4th District, was joined by officials from the L.A. Zoo and the LADWP for the opening of a new recycled water filling station. The fill station is open every Tuesday from 8 to 11 a.m. for Los Angeles residents and business owners who want to pick up free, disinfected recycled water for non-drinking uses like watering trees, shrubs and lawns. The recycled water fill station pilot program helps with water conservation by offsetting demand for drinking water. The fill station is located on the northern side of the L.A. Zoo parking lot at 5333 Zoo Drive. Residents can receive up to 300 gallons of disinfected recycled water. They must present their LADWP bill and undergo a training session to learn about the approved uses and proper handling of recycled water. Participants must also bring their own water-tight containers and sign a user agreement. The fill station at the L.A. Zoo parking lot receives recycled water from the L.A.-Glendale Water Reclamation Plant. L.A. Zoo director John Lewis said the zoo is committed to saving water, and the new fill station is another way residents can also help conserve during the drought. Recycled water is wastewater that has been processed through primary, secondary and tertiary treatment and disinfected with chlorine. It meets State Water Resources Control Board standards and safety regulations and is safe for all human contact except for drinking. The Recycled Water Fill Station pilot program will soon expand with the opening of another fill station at the L.A.-Glendale Water Reclamation Plant, where customers can also receive water on weekends. For information, visit www.ladwp.com/RWFS.